Minister for Western Sydney and Minister for Sport Stuart Ayres joined Member for Parramatta Geoff Lee to tour the rapidly developing stadium already injecting millions into the Western Sydney economy. “Western Sydney Stadium is on track to open within months – a new home to showcase our finest home grown and international sporting and international entertainment acts right here in Parramatta,” Mr Ayres said. “This venue will revolutionise the visitor experience and ensure fans are closer to the action than any stadium in the country, all within an inviting all-year round precinct featuring green space, BBQ decks and kids playgrounds. 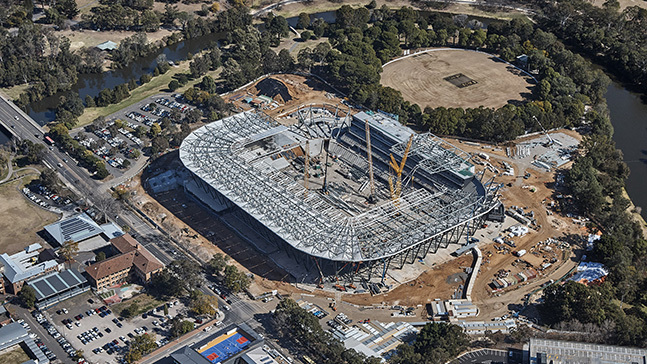 Member for Parramatta Geoff Lee said the progress of Western Sydney Stadium is boosting confidence in the business community and wider community alike – already injecting millions of dollars into the Western Sydney economy. “This stadium project has already created 1,200 jobs alone in the construction phase, with hundreds of additional jobs created through more than $60 million in local business contracts ranging from turf for the playing field, to concrete and steel,” Mr Lee said. Find our more about Naming Rights and Procurement for Western Sydney Stadium here. Originally posted on Venues NSW.